No characters bento for today. I prepared bacon and carrot fried rice covered with the omelet. Or should I called it omurice? I made the green egg sheet first and then made the flower shapes with my cutters. While I was making the omelet, I put some of the green egg sheet flowers on the top of the omelet. I learned this technique from Susan Yuen. She has done it before with the spam/ham bear head, if I was not mistaken. This was fun to do, you would never get bored putting different shapes on the top of the omelet plus you did not have to worry because they would stick together with the omelet. Inside the box : bacon and carrot fried rice covered with the omelet (omurice), chicken stick nuggets, prawn balls, green beans, oranges, and purple corn. Tomato sauce were put inside the tomato sauce cup. It sounds so nutritious and the colors are so pretty. The two little people are so cute. How did you color the egg sheet green? I like this bento. Yes, great idea with the egg sheets and omurice! You don't need characters when you have those cute cute picks!! That has to be the most beautiful omelet I've ever seen! Wow. @hapabento : Thanks a lot Debra! I guess I really need to find out how to make egg sheet. this is the most elegant omurice i have ever seen! your egg sheets always come out as thin and consistent as paper, and the edges of the flowers here are perfect. also, purple corn - what a great contrast! @gnoegnoe : Thanks a lot Gnoe! I love using egg sheet ... I can get so many colors and easy to make shapes :) Hope you can try it! Great idea with the egg! I love the flower shapes. So creative, Lia! Beautiful box Lia! The flowers add such a touch of spring! I like how exact you place everything. I would love to eat this one, sounds good too! I love the fantasy-world feel of this beautiful bento, how you've created optical illusions and played with scale here! Like everyone else, I admire the perfection of your omeurice, and all the sweet refined details that make this unmistakably "Lia"! 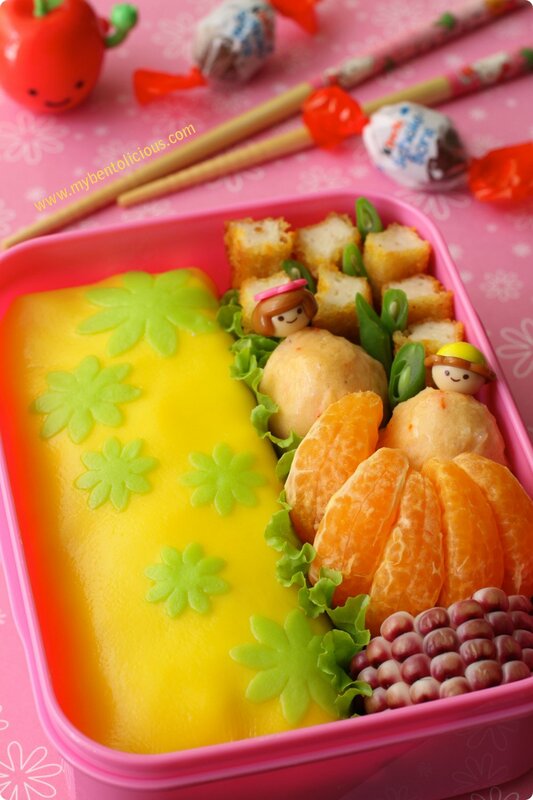 Gorgeous bento Lia! It is so beautiful, love all of the details with the flowers. I heard the news of the earthquake just now. I worry so much. @babykins : Thanks a lot Izumi for your comment and concern! I just heard too, the earthquake is in Aceh but it's far from Jakarta. Hope nothing bad happened there. Aceh had a big earthquake and tsunami last time. Do u add the green flowers while cooking ?